July 1 Things are different now. Moscow is very different from the city I visited in the early nineties. It was really gray and dank then, hardly any shops and virtually nothing in the few shops I saw. Now it’s bright and clean and very European, very French. Boats drift past on the winding River Moskva and 25% of the city is parkland. 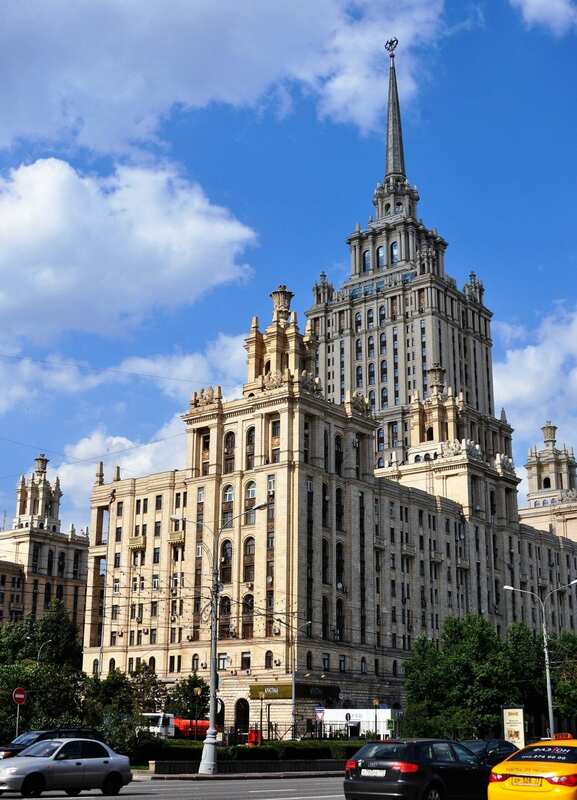 The old soviet monoliths known as The Seven Sisters still soar above the skyline but they’ve been turned into hotels and other useful buildings. I’m staying in one of them. It’s very plush. There’s a Rolls Royce showroom in the foyer. A sign says it has a panoramic terrace, so I venture up in the lift to see the view. Men in dark suits are loitering on every corner and staircase eyeing me up suspiciously. Maybe things haven’t changed that much then? My camera is given the once over and barred as being too professional. Apparently I might take pictures of the spanking new White House over the river. That’s where the president lives of course. So I acquiesce and sulk and go down again, to the river and takes lots of photos of the White House. It’s very picturesque against the blue sky and cotton wool clouds. We have dinner at the famous Turandot restaurant. All gold Chinoiserie (of course) and fine food. Even the toilets are really fancy – gilded blue and white florals. I have the photos to prove it. The urinals are especially pretty. I had looked forward to some sleep as I had an early start yesterday but it’s another early departure and Moscow is three hours ahead of BST, so I’m up at three in the morning. Today is spent touring the city. The Kremlin, the fortress home of the tsars. 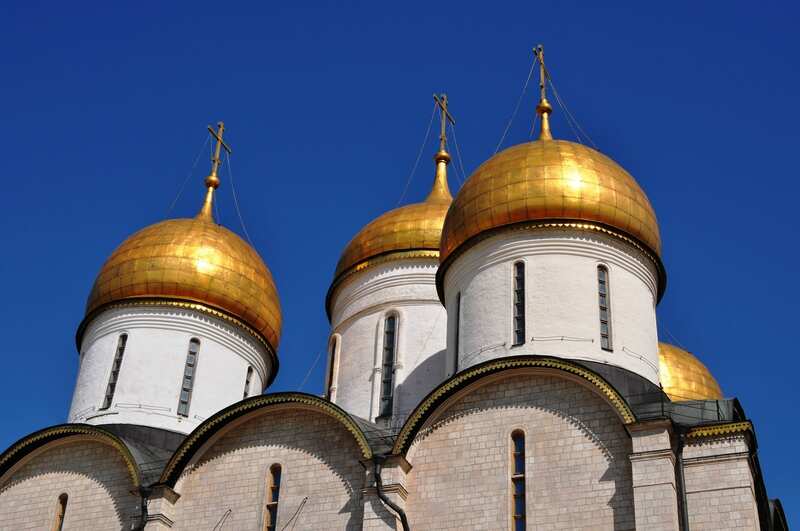 The serried golden onion domes of three cathedrals nestling within red brick walls. The largest bell in the world and the largest cannon in the world. For a moment I wonder if I’ve been misdirected to Texas. But first a tour of the armoury. We are lucky enough to get the whole thing to ourselves. Wedding costumes with impossibly nipped waists, an assortment of thrones, carriages, crowns, icons and book covers with jewels the size of eggs, armour ( of course) and fabulous Faberge eggs. I waste time deciding which one I would select if offered the choice. The Great Siberian Easter Egg contains a clockwork train with gold engine and coaches. Lots of stories about the first tsar, Ivan the terrible (apparently he was awesome rather than awful) and Catherine the Great (a bit of a goer who may have bumped off her husband). Then Red Square. I’m told that red in Russian also means beautiful. More red (or beautiful?) brick towers and Lenin’s mausoleum nestling in the middle. You can go and see him but they are likely to remove him any time now. He’s no longer really a hero. The statues of most of the communist leaders were ripped down a long time ago. GUM, once the largest department store in the world, still runs all down one side but it is now a galleried flower bedecked shopping mall. 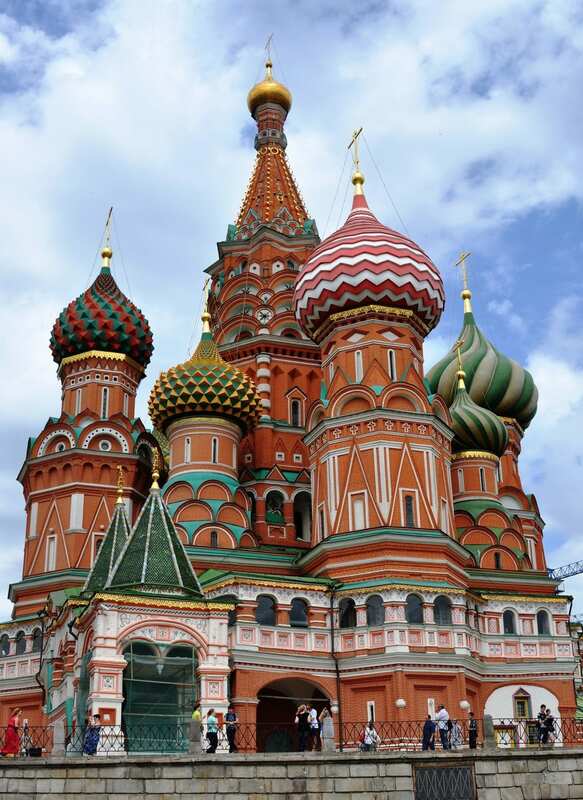 At the far end St Basil’s cathedral still entrances, kaleidoscopic onion domes and more icons. Ivan had it built to celebrate his victories and then blinded the architect so he could never build anything so beautiful again. Terrible sounds like the right adjective to me. Lunch is at the Cafe Pushkin, another famous eatery. It started life as an apothecary serving hot chocolate to attract customers and the toilets in the old stone basement are still authentic. I’m getting a bit of a reputation for taking pictures of all the porcelain. Poor Pushkin. His statue is just up the street. He was killed in a duel over his too pretty wife and left her with five children to look after. The food is very Russian. Bortsch and beef stroganoff. The story is that Count Stroganoff invented the dish for a man who couldn’t chew very well. It sounds less romantic when put like that. Back out into the awful traffic. More constructivist (modern soviet) architecture, all renovated. And another gold domed cathedral in the middle of the city. Like much of the city this has been very recently restored. Although in this case it was entirely rebuilt. The soviets demolished the last one to build another gigantic monolith and then discovered that they couldn’t build foundations strong enough to take it. So then they built a swimming pool, the world’s largest, naturally, and now it’s a cathedral again. A quick tour of some extravagantly decorated metro stations. Chandeliers, mosaics and bronze statues. Then to the station to get on the train. I’m off across the largest country in the world. It will hold the USA and all of Europe (except Russia!) with room to spare. It crosses ten time zones in all, so while the sun is rising in Moscow it is setting over Vladivostok and the Bering Straits. So far opulence rules ok. At the railway station there is a VIP lounge with champagne, a harpist and a brass band. Cute cabin attendants stand on red carpets to help us into our cabins, all swags, lace and brocade. Up front there are two restored locomotives, getting up steam. The drivers are already black faced and brow mopping. 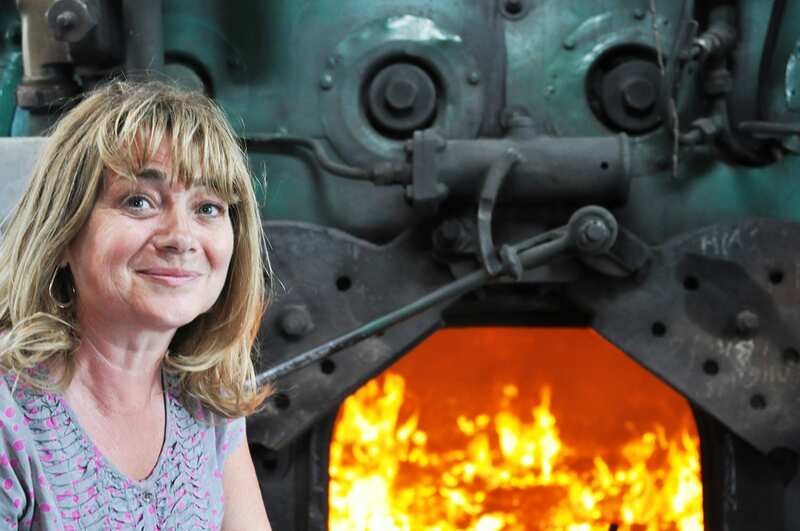 I clamber up the iron ladder onto the cab and peep into the huge firebox- it’s just like the gates of hell. Lots of piercing whistles and we’re off. I thought I might catch up on my sleep, but once more maybe not. The train is swaying and rattling, the tracks not yet welded all the way. It’s light most of the night and I’ve eaten too much. It’s a continuous feast. There’s a smiling attendant in each car ready to indulge my slightest whim and a huge bowl overflowing with cherries, grapes and other essential items at the end of the corridor, Having a shower is an adventure. My compact bathroom is a wet room that converts to a shower cubicle by unfolding a curtain all the way round. Amazingly, it works. Into Tatarstan, a self-governing region of Russia that’s larger than a lot of countries. Conquered by Ivan the not so terrible. Lurching on to Kazan the capital of Tatarstan on the sweeping Volga River, I’m singing the boatman song quietly but to my dismay no-one else seems to feel the need to do so. Here there is a very white medieval looking kremlin. 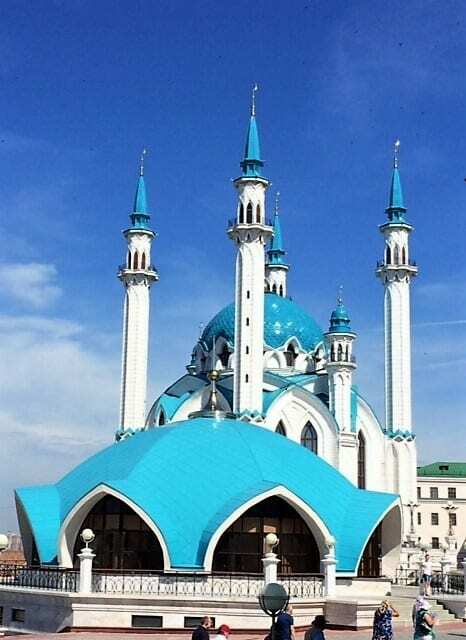 There is a fancy new turquoise mosque in the centre, (many of the Tatars are Moslem) next to still more onion domed Russian orthodox cathedrals. Light blue with gold stars this time. There’s also a seven storied wedding cake tower of brick that leans. Ivan had this one built, at her demand, for the woman he insisted should marry him. She did. Then she went up to the top and threw herself off. So the story goes. Kazan is a very modern clean town, like Moscow there’s been lots of renovation. The locals are very proud of it. Our guide says 80% of the people are happy to live there. I suppose that’s good. There are huge sports complexes, enormous stadia, long shopping streets and brown glass university and government buildings in French Renaissance style with curling decorations on top. Today’s lunch is in a Tatar restaurant – sturgeon soup and potato pancakes followed by opera singing. And back to my hotel on wheels. Nothing it seems has been forgotten; there is a pianist in the bar and the harpist has been installed in the dining car. There’s also a doctor and a guest lecturer. It’s twenty five years since the railway company was founded so the president, Tim, is also with us. Fewer guests than usual though. The problems in Ukraine are making travellers wary. At dinner a sucking pig all decorated with latticed pastry and cherries is wheeled in. Still not caught up with myself or my sleep. We have crossed a time zone so I lost another two hours last night. The toilet roll managed to unravel itself with the motion of the train. It looks as if my bathroom has been savaged by the Andrex puppy. Past swathes of birch forest – there’s an awful lot of this- and over the Ural Mountains to Yekaterinburg. Mountains is an exaggeration. They are green wooded hills here, old mountains creeping up to not quite 2000 metres in the north, near the arctic. Great excitement as the Urals are the continental divide between Europe and Asia. We are taken to a line next to the wooded highway with a little spiral monument marking the spot. A soldier meets us and demands to see ID. None of us have any so he threatens to fine us – with champagne! So I chase him with his baton. All very jolly- there’s a wedding up here too. Apparently this is the place to have your wedding photos taken. If this is the high spot of town that says it all. Yekaterinburg is not exactly humming. Prosperous, but not like Moscow or even Kazan. Neither Asian nor European. Everyone seems to be scratching around to find us something to do. 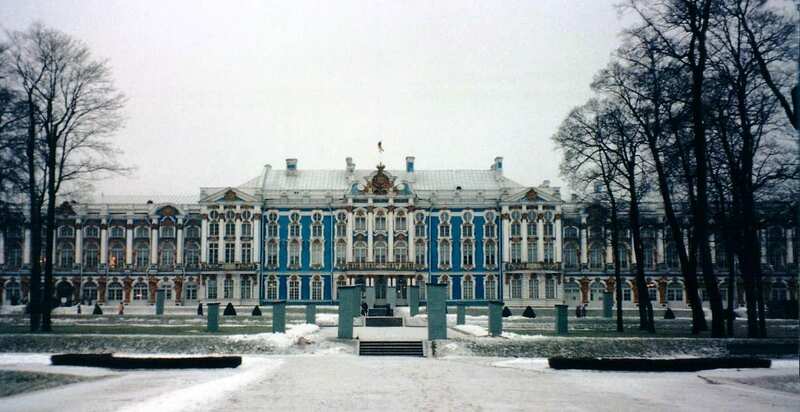 Other that is than visit the city’s main claim to fame, which is the place where the last tsar and his family, the Romanovs, were assassinated. There’s a church built over the basement where the gruesome and amateur shooting was conducted. It’s been named Church of the Blood, which only goes part way to conveying the barbarity of the execution. Boris Yeltsin came from a peasant family in the area and studied civil engineering here. So there are statues of him, though they have been vandalised. There’s also, as always, a statue of Lenin. It’s the only one in town that the pigeons don’t sit on. So it’s either got a hidden source of electric current or the pigeons are still communists. Another frilly restaurant, more Russian food. And back to the train past decorative malachite painted wooden houses and bypassing half a dozen more brides. They are all out posing for pictures. The grooms are hiding in their cars. Hurrah, that was a better night’s sleep- I found my aeroplane mask. Though it could have been all the vodka I was given with last night’s feast of Russian pickles. And we have gone forward yet another hour. That’s six hours in front of BST. Now we are actually in Siberia, which stretches over four thousand miles from here right to the Pacific coast. Siberia is notorious for being a place of exile, first to the salt mines and then to the gulags. Though it seems that the prisoners were more likely to work in the gold, silver or coal mines than the less common salt mines. Lots more birch and aspen forest. It’s becoming lower and swampy, proper taiga now, thinning out into the flat steppes. There are also quite a few villages and towns. Most of the houses are made of wood with very steep pitched roofs. In winter it’s continuous snow and often minus 40 degrees. Fortunately, it’s still a very pleasant summery 25 for my visit. The morning is spent on the train, more time to catch up on snoozing, the swaying of the train is very soporific. 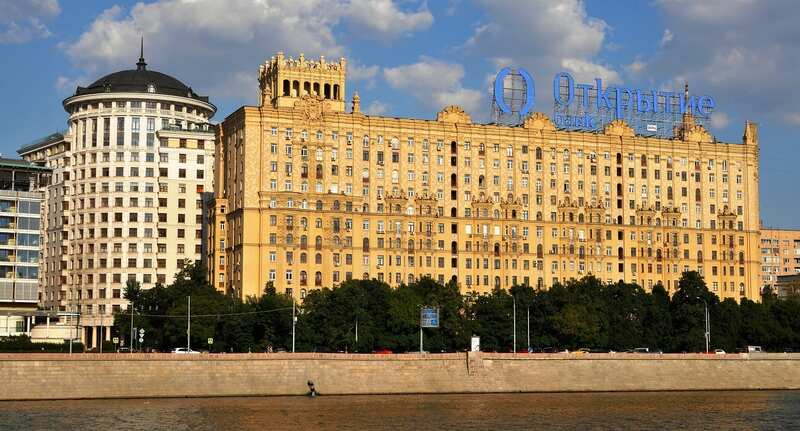 Then to Novosibirsk, a town like Chicago that grew up recently and very rapidly because it is on crossroads of the east-west railroad and the north- south River Ob. Here they have the second biggest theatre in the world, designed to accommodate the annual December soviet military parades so the dignitaries didn’t have to sit outside in the cold and watch. As you can imagine the stage is pretty big, large enough to take all the soldiers and tanks. We get a back stage tour while the poor director is trying to rehearse a musical that’s about to go into production. Now more railways- a whole outdoor museum full of brightly painted locomotives with a few Dr Zhivago carriages, a grim prison truck and an equally grim hospital on wheels. There’s rather too much information about dates and factories for me. Yet another hour forward. Seven hours in front of BST. Today there are no long stops and we are exhorted not to wander off the platform should we dare to alight at any short stops for water and fuel. I have a late breakfast assignation with Tim, the president, as I told him at dinner last night that the scrambled egg wasn’t very good and he wants to see if they cook it the same when he is there. They do, but not for him. It’s a good time to take stock of my fellow passengers. They are a mixed bunch, nearly all retired. There is a gay couple from Melbourne who supply the Ascot set there with hats, scarves and jewellery, retired doctors, farmers from Australia and Wyoming and several entrepreneurs. One guy owns the Danube express. I’m not sure if he is sussing out the competition, but I think he and Tim are going into business together. Another Turkish passenger operates rail holidays out of Turkey. There’s a lot of geek talk at meal times. Most of the staff are lovely and they all have stereotypical Russian names: Olga, Tatiana, Igor, Nikolai. I haven’t been able to make the barman smile yet. Tim says he’s sacked him three times already but he keeps turning up for work. A good time to also to find out more about Russia. There’s a really interesting documentary shown on Putin and a lecture on Russian politics by our tame professor. Then I practise reading my Cyrillic alphabet. It’s not hugely different to Greek. What with all that the time is flying by. So does the scenery. The guide books all say that the Siberian scenery is boring. The authors obviously haven’t been here. It’s mostly really pretty, green hills splodged with purple rose bay willow herb and dotted with little wooden villages. Meadowlands and of course, still more forest. There’s a huge contrast between the countryside and the large modern, concrete railroad towns. For dinner caviar with sour cream and blinis followed by chicken Kiev. All washed down with champagne and vodka. So it’s been a very Russian day. And a very calorific one. Eight hours in front of BST. 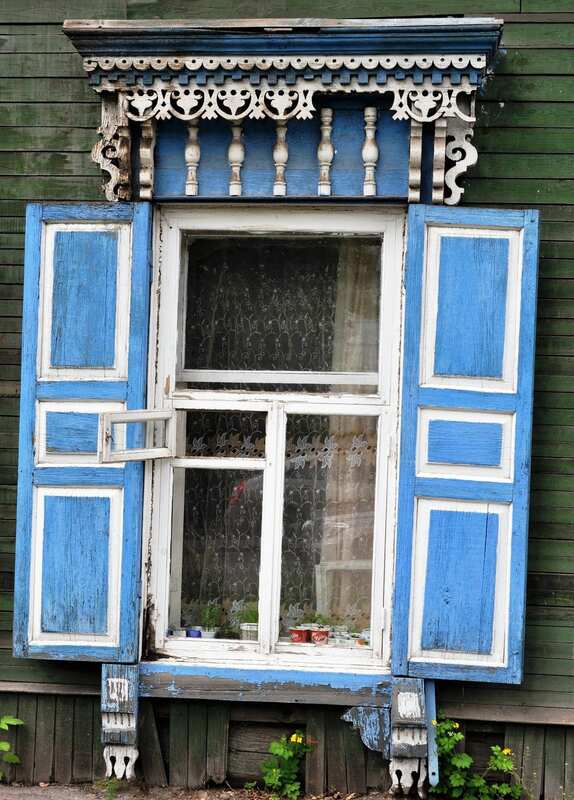 Irkustsk is a melange of old and new, traditional wooden intricately carved houses with bright painted shutters and grey apartments. There’s a handful of pretty churches, river parks and a market that is pretty much like the one in Leeds, except that this one has wide faced ladies of Mongol extraction serving the butter and cream. I get to drink tea with a dentist from the soviet era in her very middle class apartment. Its three main rooms are stuffed with furniture and knick knacks and there’s a TV in each room. Aspirations seem to be the same the world over. Lunch is palmini, small dumplings in broth, served in velvet booths in a swish business restaurant. Then there’s a visit to Volonsky’s house. He was a Decembrist exile from the 1825 uprising. When they were released from gaol and work in the mines the exiles were allowed to build houses. Some of their wives followed them to Siberia and the families were very wealthy so (if they had survived) they led an affluent life style, staging their own recitals and concerts, as they were not allowed to visit public places. The city was therefore often described as the Paris of Siberia, though again one wonders if the authors of such quotes had ever been to Paris. We are given our own concert of opera singing ending with the rousing drinking song from Traviata and more champagne. Then we are driven out past yet another huge river to a cluster of wooden summer cottages, the dachas. Here, a family serves us a meal of salad from their garden and surprisingly good meat balls. And more vodka. No time change!! 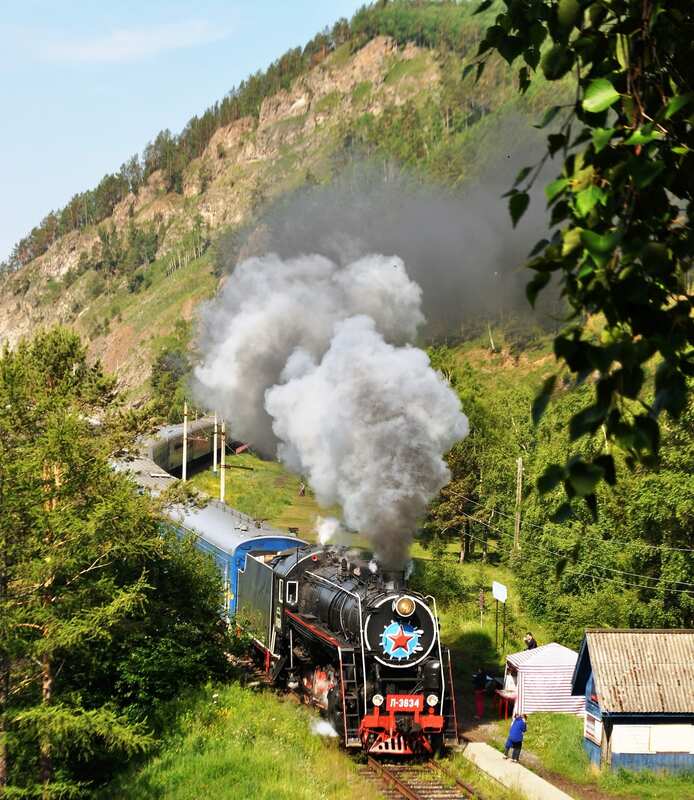 We have chugged a short distance to the southern tip of Lake Baikal. Chugged is the right word. We have now picked up another steam locomotive and we are allowed up onto the platform of the rear locomotive to take photos of the engine, as we amble along the bays of the lake. I feel very adventurous. The whistle is really shrill and there is plenty of smoke, especially as we pass through some longish tunnels. It wasn’t the best day to wash my hair. A boat trip to a village across the River Angara. There’s a museum with some facts and figures about the lake. It’s 20 to 30 million years old and nearly 400 miles long. At over a mile to the bottom it is the deepest lake in the world, but it used to be over five miles deep; it’s gradually silted up. 336 rivers empty into it and only one, the Angara flows out. A local legend says that old man Baikal had 336 sons, but only one daughter, Angara. She was beautiful and wilful and angered her father by refusing to marry the feeble Irkut, preferring the strong Yenisei (Russia’s longest river). One night she slipped away and fled north to her lover. As she escaped her furious father hurled a huge rock after her. Angara got away, but the rock remains at the mouth of the river, with only a small peak of it showing. The lake contains 20% of the word’s fresh water and in winter it freezes over. The water is certainly very clear. The Russians are proud of their scenery here, with rolling green hills all around and mountains with a lick of snow just visible to the north. There are a couple of freshwater seals frolicking about. The seals feed on the many fish that are caught in these waters. We feast on some of the fish and shaslik (kebabs) at a barbecue lunch by a bay. Some hardy souls also go swimming. The water is so deep that it never gets warmer than four degrees. When they come out (and they are definitely not in for very long) the bathers are presented with certificates. Personally I think they should be certified instead. Another museum in the afternoon, this time vernacular architecture, much of it rescued – not dissimilar in style (if not building design) to the open air museum at Singleton in Sussex and equally fascinating. Nearly everything here is constructed of pine planking. We’re still sampling Russian cooking. Tonight, herring salad and stuffed cabbage leaves. (With sour cream of course, everything comes with sour cream). Really delicious. We didn’t move last night. Strange going to sleep without the rocking and rolling of the carriages. A longer boat cruise north along the lake and some fishing, catching the local delicacy, omul. The wind is chilly over the icy water and we are pleased to be wrapped in blankets. There is enough fish caught to provide lunch and this is smoked over aspen wood fires. The professional fishermen from the boats also show us how they make herb tea and soup with great bundles of leaves from the forest. As the day or progresses the sun is reassuringly warm on our backs and there are pretty walks to be had, ambling along the lake shore. We can also try panning for treasure in the old gold rush area at the mouth of the creek where we have set up our picnic. Then there is a folklore concert with an accordion and balalaika. (I was beginning to think they only featured on Russian films). Vodka fuelled tourists participate in the dancing with more enthusiasm than grace. Ulan Ude is a sprawl of colourful wooden houses that developed on the tea caravan route from China. 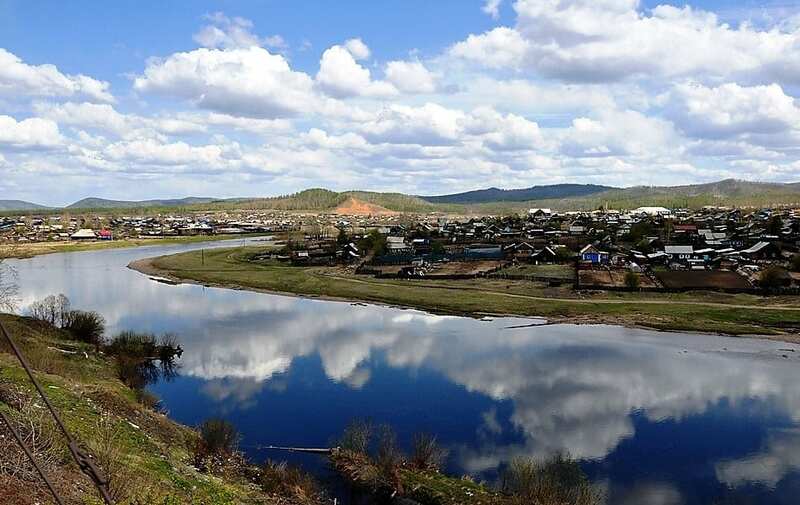 It is the capital of the Buryat Republic, where many of the people originally migrated from Mongolia. We are a long way now from modern concrete constructions, though there is a cluster of civic buildings around an enormous bronze Lenin head in the centre. This is the most strongly Buddhist area of Russia and shamanism is still a dominant religion here too. But we visit an Old Believers Village. 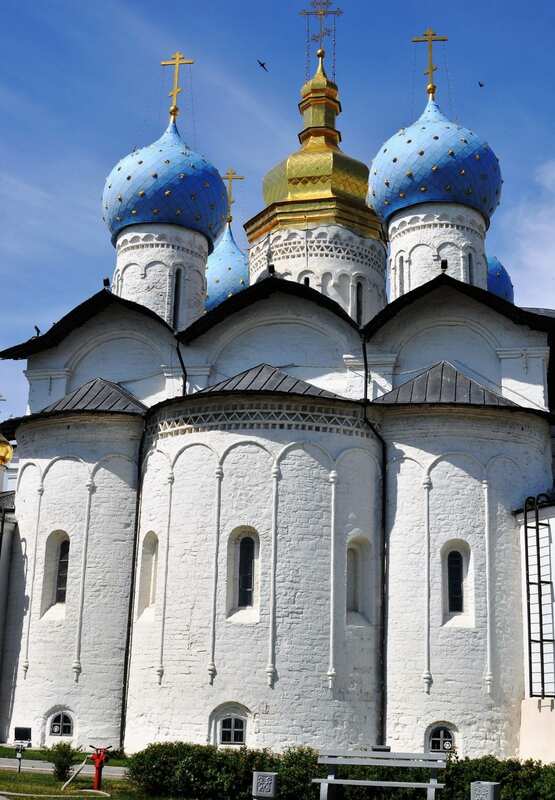 The people of this Christian religious sect fled persecution by the tsars in the seventeenth century. They have survived the more recent destruction of their churches by the soviets and live a quiet rural life adhering to their old rules. Priests do not cut their hair or shave and church services are commonly eight hours long. Twelve hours at Easter. There aren’t any chairs in the tiny churches and the people are only allowed to consume water whilst the service is ongoing. The houses are delightful, mainly blue and white carved floral designs, with summer and winter areas. The equally brightly dressed people cook lunch for us, although the repertoire is now familiar. Soup, meatballs, shaslik, smoked fish, doughy pastries and vodka. This is succeeded by the inevitable cultural performance, including audience participation. The scenery is increasingly scenic as we begin to head south. Craggy grass covered hills, lakes, wide meandering rivers and the odd ravine. It’s our last night on the train so it’s sturgeon and steak, with too much champagne and port that was bottled in 1880. To see more of my photos of Russia, visit this page. To see more of my photos of Russia visit this page.